Today when there is a dispute between nations, the major newspapers of the different countries put their own spin on a story. For example, when a US spy plane was downed on Hainan Island, the People’s Daily in Beijing provided an account of the matter very different than that provided by the New York Times, each trying to project a picture of the other nation to accommodate its own concerns. Now imagine yourself in the eighteenth century, when international reportage was in its infancy and there were no international newspapers. How would such a scenario manifest? How did nations project a favorable image about themselves and how did the travelers who wrote about other nations form their opinions? These are important questions to consider to understand the evolution of international relations in modern times. The Chinese Pavilion and Philosopher’s Studio at Bonnelles. 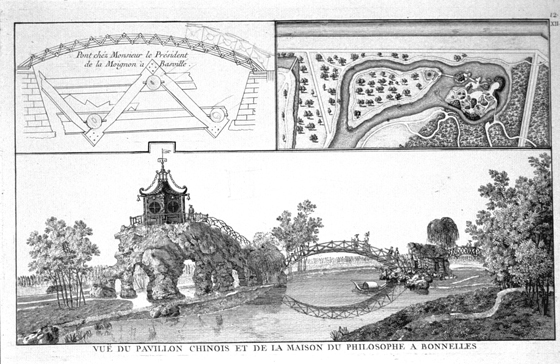 Steel engraving by George Luis Le Rouge, Jardins Anglo-Chinois, 1776. Photo courtesy of Dumbarton Oaks. 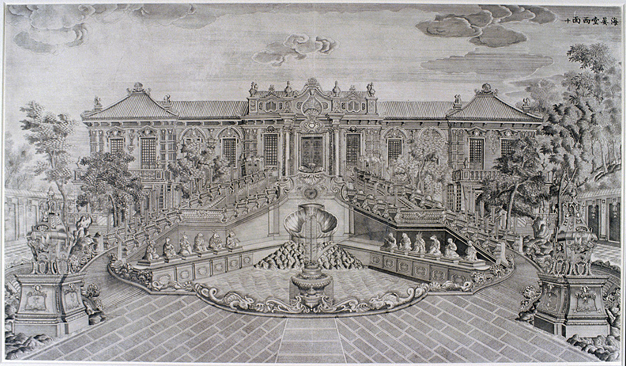 In the past, palace architecture, city architecture, and courtly ceremony and accoutrements were probably the most important means by which to impress visiting foreign dignitaries, but, by the eighteenth century, amidst a climate of international cultural competition, gardens came to be regarded as an important measure of a nation’s civilization. Therefore, kings and emperors throughout Eurasia were building gardens with sections specially designed to look similar to the gardens of other nations! The design choices in a garden were used to indicate the nation’s international level of sophistication and present its most positive image. Therefore by the mid-eighteenth century, the English had their Kew Gardens, with buildings meant to look Chinese and Turkish; the French also had gardens built in imitation of Chinese garden taste; and in China, Emperor Qianlong had special structures built in the European style. These buildings were situated in a garden called the Garden of Perfect Enlightenment. If you understand the story of this garden and these buildings, you will understand much about the role that culture played in international relations at the very beginning of what is called the modern era. Want to know more? Look at the next page: WHAT IS THIS THING?